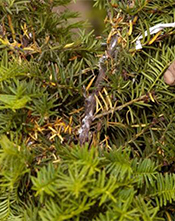 There are at least three species of Mealybugs that feed and reproduce on Yews. This insect can completely cover heavily infested branches and trunks with a waxy secretion. 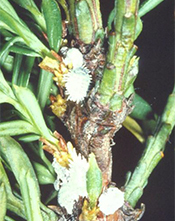 Taxus Mealybugs feed in the inner bark tissue of the trunk and branches. Feeding discolours needles and causes excessive needle cast. Severely infested plants may be sparsely foliated and the remaining needles and twigs caked with honeydew and black sooty mold. The Taxus Mealybug is a slow-moving, white woolly insect. When present in moderate numbers, they cluster in the unions of twigs and branches. Adult females are present from June to August and begin giving birth to living young in early summer. 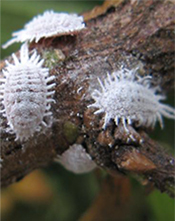 The Taxus Mealybug spends the winter as a first-stage nymph in bark crevices or beneath the old, dirty white discarded skin. There may be one to two generations per year. Use insecticides on the bark of small branches and twigs to control nymphs when the Chestnut is in bloom. Apply horticultural oils when plants are dormant. Apply Landscape Oil to target nymphs when new foliage is fully expanded and hardened off.